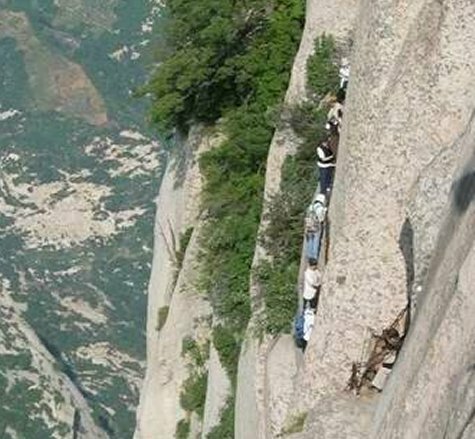 You are about to view pictures of a mountain hiking trail on Mt Huashan which is located in China. 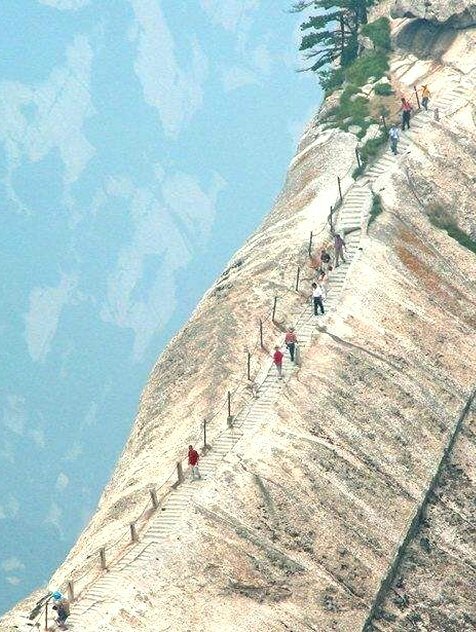 After you see the pictures, I have little doubt you will agree that it appears to be a very risky Hiking Trail. There is a big difference between mountain climbing and mountain hiking. Mountain climbers have training, experience, and equipment. They also know full well the risks they are taking. Mountain Hiking is usually done by amateurs. I am more the hiking type myself. I remember walking to the top of Longs Peak in Colorado. It was a long way up there. It took the better part of a day, but it was worth it. The view was stunning, the weather was wonderful and the workout was exhilarating. Of course I was tired, but I didn't care! I still consider that climb to be one of the most enjoyable days of my life. One memory I carry from the Longs Peak experience was that I was never in fear. The trails were well-groomed, there were ropes on either side of the trail whenever necessary, and there was no area steep enough to require stairs. It was simply a long, very pleasant walk. In my opinion, there was little risk involved. Even if I stumbled and fell, there was no danger. 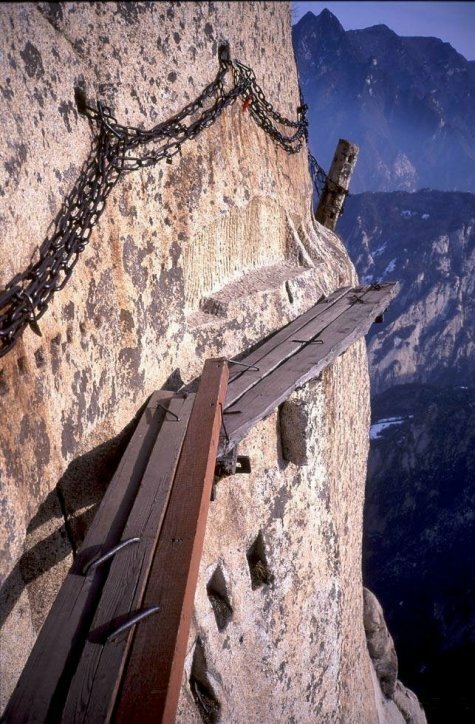 The trail at Mt Huashan is much different. 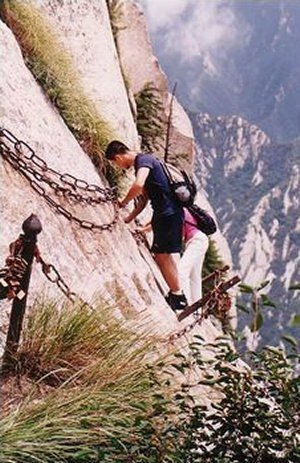 When I first posted the pictures of Huashan in January 2007, I believed it was the most dangerous trail I had ever seen. It is important to note since I first wrote this story, I have received several letters that suggest the Chinese have made significant improvements to this trail. 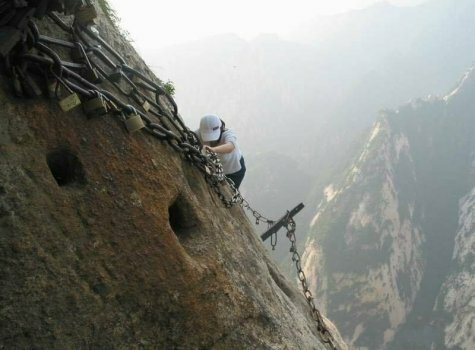 I certainly hope so because in its original state the Huashan Hiking Trail was definitely a Death Trap. In addition to the story of Frank and Laura that you will read, I have two different people - both Chinese Nationals - who have written to me of past tragedies at Huashan. In addition, I have a report of a death as recent as June 2012. 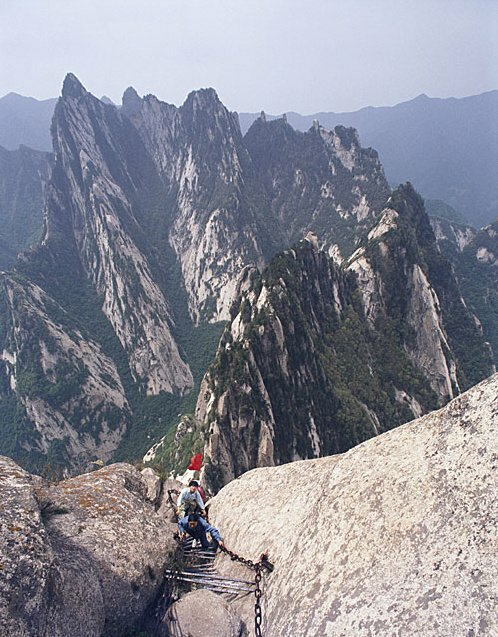 How Dangerous is the Climb at Mount Huashan? 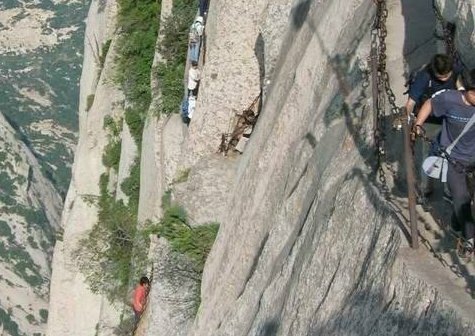 The 'climbing' at Huashan should not be considered 'mountain climbing'. Mountain climbing involves using advanced equipment and skill honed through experience. 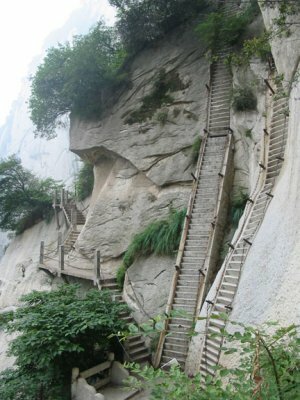 The climb at Huashan is more accurately described as "Mountain Hiking". 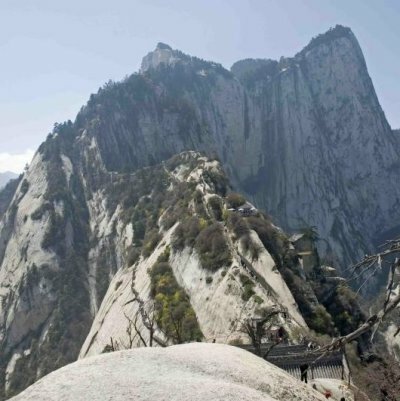 Huashan has a well-known public trail used by anyone brave enough to give it a try regardless of their physical ability or previous climbing experience. As you will see for yourself, the pictures show normal people in comfortable clothes with no equipment and no special shoes. These people are mostly what you would call 'pedestrians', i.e. average people who probably have very little experience with dangerous climbs. In other words, people like you and me. 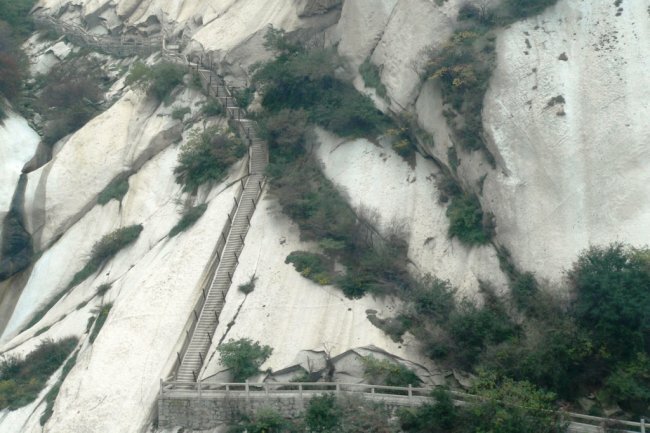 It is said there are frequent casualties at Huashan. However I was unable to drum up any Internet confirmation for this allegation. Please refer to the Google search on the right. It was made in May 2008. I had the same results for 'huashan death' as well as 'huashan accident'. Considering the tight controls the Chinese keep on their press, I might never find any confirmation. Or perhaps the information is written in Chinese; a Google search in English probably won't reference the Chinese script. That said, the pictures don't lie. My own eyes tell me how dangerous this trail is. In certain parts, one mistake and you will fall to your death. In addition, as I mentioned earlier, I have received several notes from Chinese nationals hinting at past tragedies. One note was amazing. Please read for yourself. Rick Archer's Note (May 2008): The following email series was sent to me by a man named Jim who read my passage above. 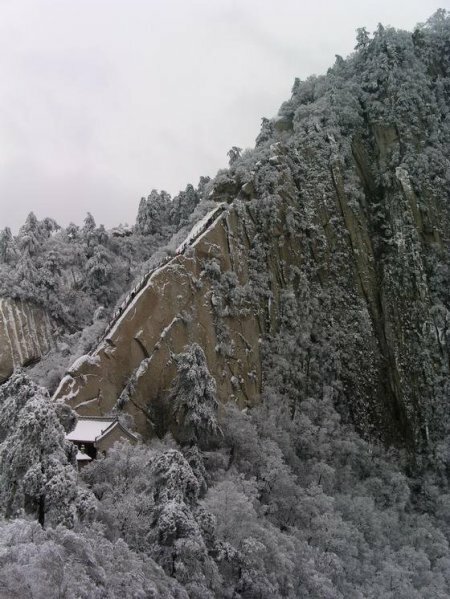 He was kind enough to share the following anecdotal information about problems at Huashan. 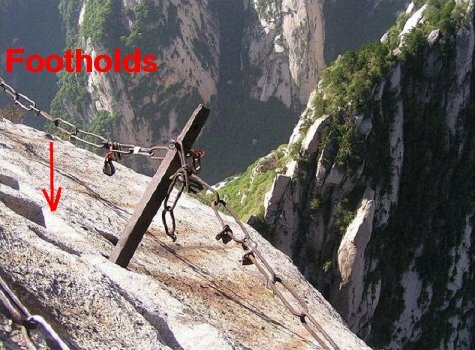 Rick, Here is some written evidence of serious accidents on Mount Hua Shan from someone who lived right there in China during the 1980's. See the email at the very bottom. This is from a co-worker of mine. Her English is not the best, but I think you will understand her story. She gave me permission to share it. It is unedited (except for the removal of her address & phone numbers) in her very own words. 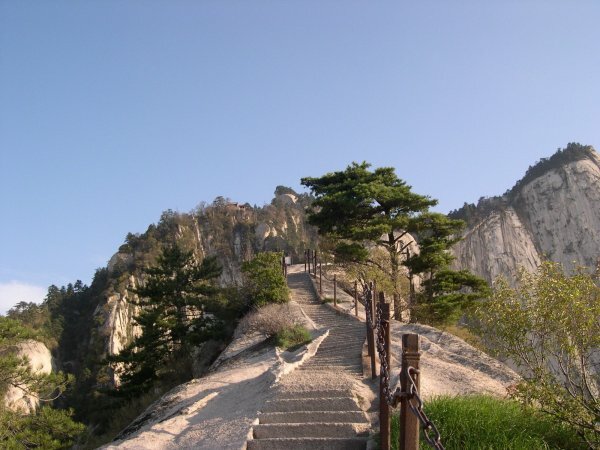 Hi Tongyan, your story about the dangers on Hua shan is very interesting to read. Would you mind if I shared your story with some others who enjoy hiking? I can remove your address & phone number information, if you wish. Jim, I was unable to find anything on the Internet but I can tell you my story about Hua shan. It happened next year I visited Tai Shan. I was in my the 3rd year in University. There was a group of students as same age as me, they were went to Hua Shan to play. Those students were from The 4th Army medical school. When they are in the middle of the climb, something happened and people from top of the mountain all drop down. ( I forget what cause this happen), since the mountain shape so sharp, it is hard for the people in the middle to prevent the drop people from top, so there is a lot of injury. And very badly. Those group of students who were in the 3rd year of their learning began to rescue the injuries immediately. (yes, there is rescue team for the traveler, but that takes time, some injured people might not able to wait). It was these group of students that offered a first time period diagnoses and huge skilful support before the ambiances and other medical personnel's come, some injured people got survived. Whole country gave them great honor. Our university "Tianjin University " actually invite them come for lectures, thousands of students were in the auditorium to listen how do they diagnose, how to help transfer the injures to the hospital, how do they assistant the operation, how many life were saved, more important how they use their text book knowledge to apply for each individual's diagnose�... This page permanently exist in The 4th Army medical school history. It is called "Hua shan Rescue". Thanks for the link, I will share this with my family tonight. I came across your website after googling "most dangerous trails". This Huashan one takes the cake! First of all, this clearly should be a one-way trail. I've been hiking in Europe where there are similar trails, chains, platforms (metal ones), and ladders. Many of these sections are one-way, clearly marked on maps and books. If you get caught going the wrong way, it's a huge fine right on the spot. There's just no excuse for such irresponsibility in my book. Last June, I was in Yosemite. I've been up the Half Dome a couple of times and decided to go up for a third time. While I was on the cables, I saw someone slip from above and slide to his death. It was the most frantic and shocking thing I have ever been a part of. People suddenly started screaming, I looked up and saw a guy sliding off the mountain with no way to stop his momentum. I can still see the look on his face, petrified, he was kicking his feet, he bounced on the rock a couple of times. He slid by me, and when I looked back, his feet hit a divot which unfortunately caused him to somersault out of view. Someone below yelled that he was "airborne", falling 4000 feet to the Valley floor. Lot of good that warning did him. The poor fellow didn't go airborne for long. He landed on a ledge about a hundred feet below the "saddle" section where the cables begin. A couple of hikers had the courage to go down there for a rescue attempt. His heart was actually still beating for a few minutes but he succumbed to his injuries. All of this happened so fast. About a year before, another person lost his grip on the cables and slid down the other side of the mountain. He lucked out when his pants caught a piece of rock that prevent him from sliding 4000 feet to his death. The poor guy was stuck there for 6-8 hours before someone rescued him. Unreal, huh? After the accident I witnessed, some people still kept going up, but I couldn't. I just had to turn around; it was no longer fun. I was so stunned, no words can describe how I felt at that time. Mt. 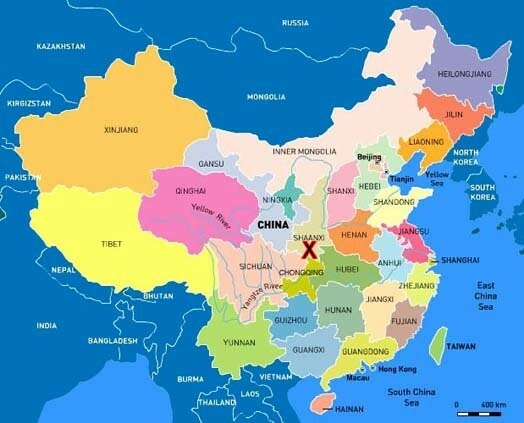 Hua is located in the Shaanxi Province of China. It stands to the south of Huayin City, 75 miles due east of Xian. 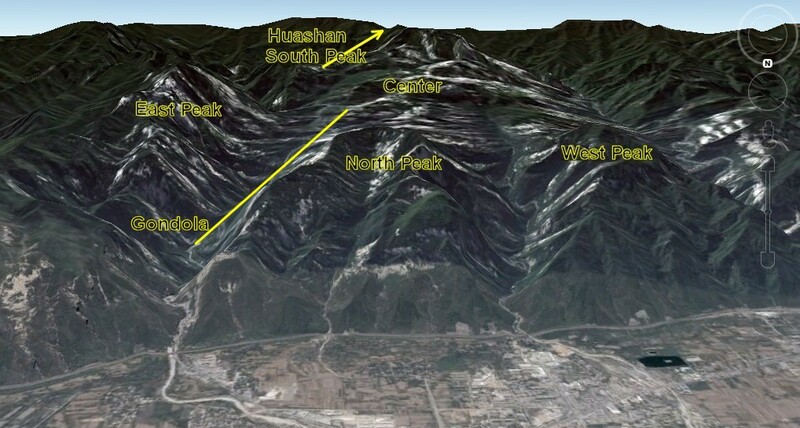 From the map, this mountain is located close to Himalayas of Tibet. 'Shan' means 'mountain' in Chinese, thus the name 'Hua Shan'. 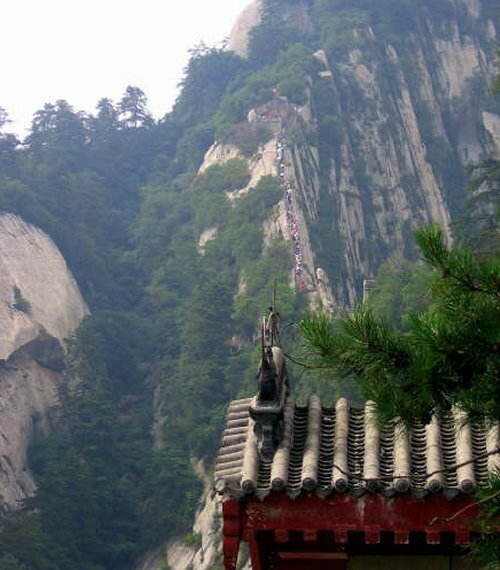 Huashan means 'Mount Hua' or 'Hua Mountain'. According to Travel China Guide, Mt. Huashan is definitely not some neglected little spot in the middle of nowhere. Quite the contrary! 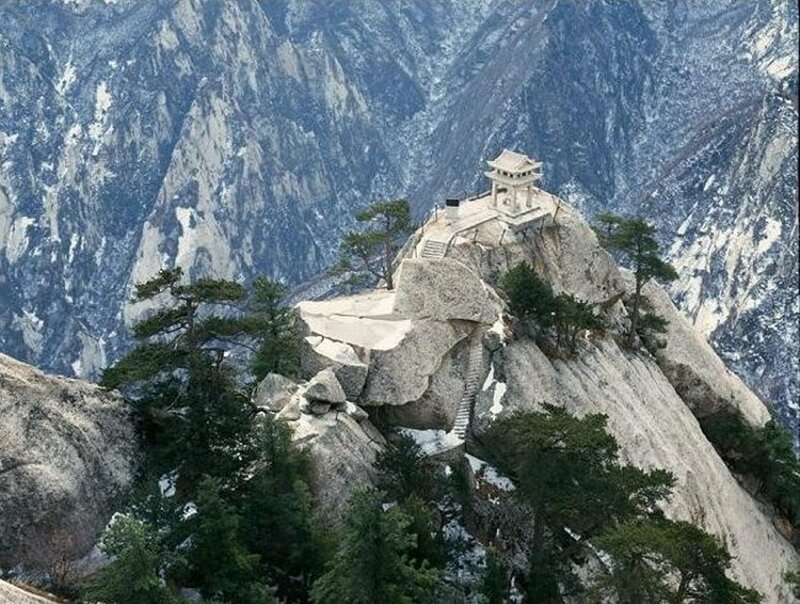 Mt Huashan is one of the five sacred mountains in China. The other four sacred mountains are Mt. Taishan in Shandong, Mt. Hengshan in Hunan, Mt. 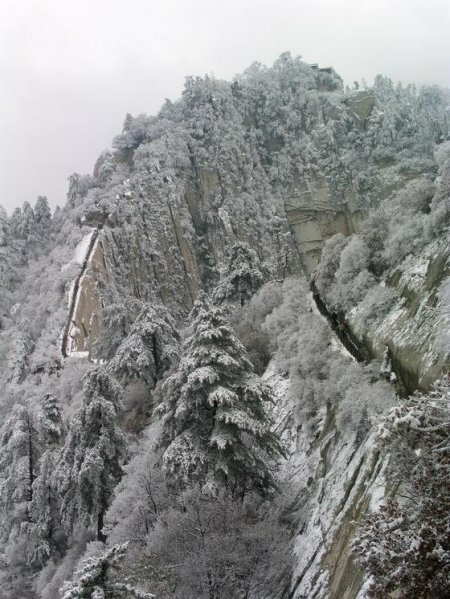 Hengshan in Shanxi, and Mt. Songshan in Henan. Mt. Hua is home to several influential Taoist temples where emperors of past dynasties made pilgrimages, making this mountain the holy land of Taoism. 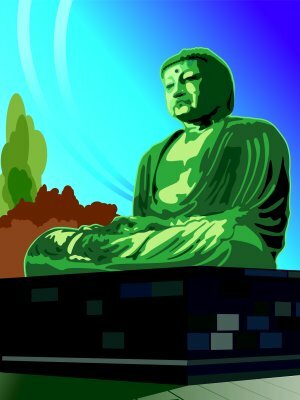 Many emperors came to pray and sacrifice to the God of Mt. Huashan. Take note that you are looking at Mt Hua from the NORTH. In other words, this picture is "upside down". Hua consists of five separate peaks. The five peaks are all very close in height. The North Peak in front is the shortest while the South Peak in back is the tallest. The East and West Peaks are the same height. Huashan is not your typical mountain with one central dominating peak. Instead the mountain is "spread out" into five different sectors. 34�29′N 110�05′E or 34.483333, 110.083333 Once you get there, remember to rotate the picture 180� to get the same view as you see here. Using a baseball infield to help describe their relative positions, South Peak, the tallest, is at second base. The North Peak is at the entrance and would be considered home plate. The West Peak is first base and the East Peak is third base. There is a Central Peak as well where the pitcher's mound would be. I am fairly sure the Chinese would not appreciate being told their cherished religious icon closely resembles a baseball diamond. They are more fond of using a flower analogy. Apparently when viewed in a certain way, the five peaks of Huashan are said to look like five petals of a lotus flower. Using the picture as a reference, there appear to be two main roads. I am fairly certain the one on the left, the East Side, is the main entrance. About 2 and a half miles down the road is the Gondola area. This must be where the buses drop many of the people off. The Gondola takes you from the base of the mountain up to the North Peak where two major hiking trails await. As you can gather from the picture, the gondola stretches a long way. It saves everyone a lot of time and energy. Many people use the gondola to go back down the mountain as well. 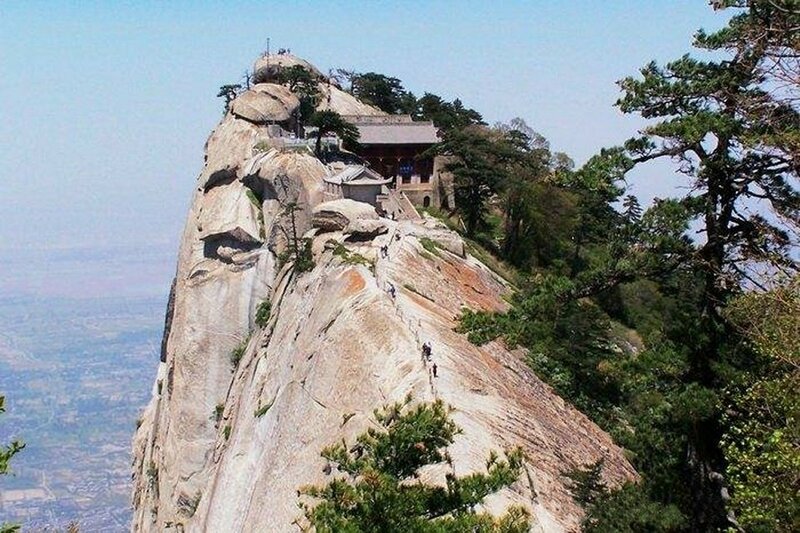 Once you are on the North Peak, Huashan is like a mountainous Disneyland. Each peak is a different realm with its own identity. You have your choice of five different peaks to tackle. You can spend all day here and still barely scratch the surface of all the things to see. The mountain is so spread out that literally thousands of people are climbing the various peaks all day long. You can spend your entire day on the North Peak or the West Peak or move back and forth if you have enough energy. This vast mountain world is a separate reality, your own little world. 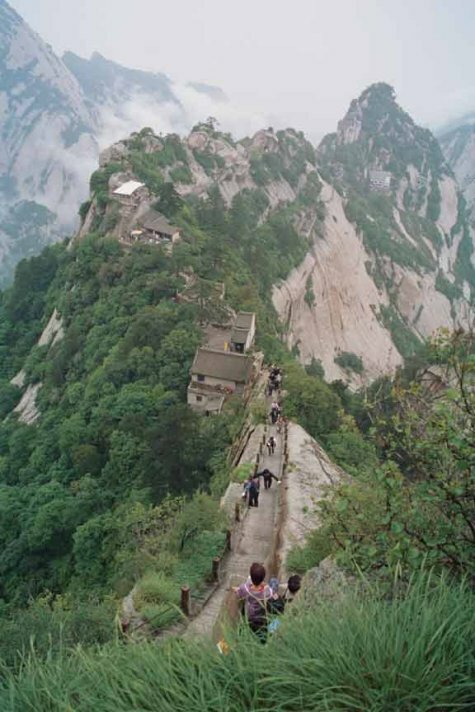 Some people call Huashan a 'Shangri La' of sorts. Civilization is just a memory up here. Originally Hua was called Xiyue - meaning 'Western mountain' - because it was the westernmost of the five sacred Taoist peaks. It is the dominant mountain in Quinling mountain range. Formerly the five mountains were dotted with temples but today only a few remain. 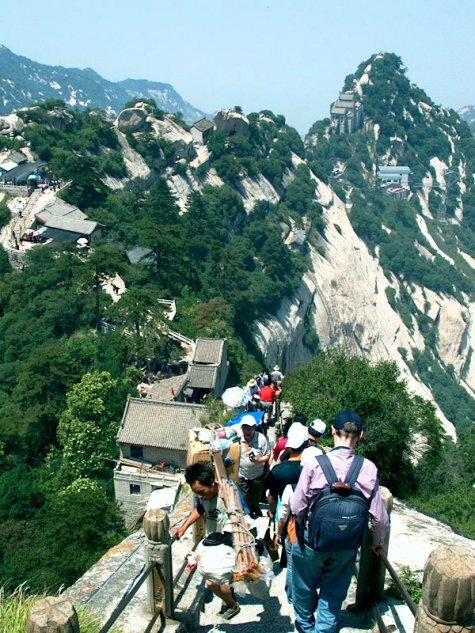 These days the majority of visitors to Huashan are Chinese youth on vacation. However the mountain routes are still trekked by devoted pilgrims and wandering monks intent on visiting the sacred shrines. The North Peak was called Clouds Stand by ancient people. Today it is called the Cloud Terrace Peak as it looks like a flat terrace in the clouds. The peak is 1,614 meters (about 5,295 ft) above sea level. An important site on the North Peak is Zhenwu Hall (God of North). The majestic South Peak is the tallest. With an altitude of 2,160 meters (about 7,087 feet), ancient people called this the 'Monarch of Mt. Huashan' because it is the highest peak of Mt. Huashan. 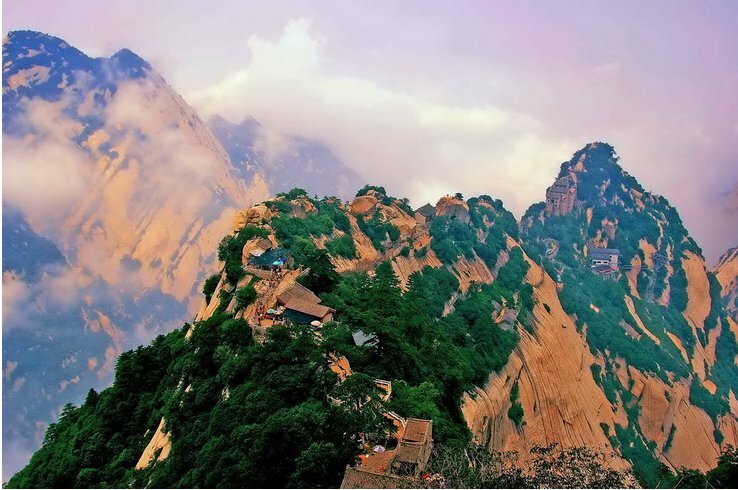 It is also the highest peak among the Five Sacred Mountains of China. The temple for the God of Mt. 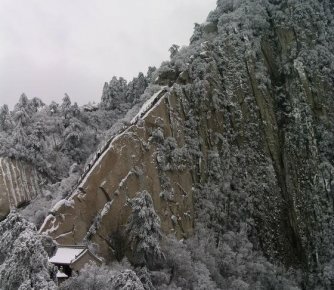 Huashan is situated on the South Peak. Tourists who summit South Peak are rewarded with panoramic views of the surrounding mountains. The famous Yellow River wanders far below and everything seems small. The South Peak is the dangerous peak at the center of our story. The South Peak is very popular for climbing despite its peril. In the middle of South Peak trees are luxuriantly green, creating a good rest spot. At the top of South Peak, the 'Black Dragon Pool' at the summit and the 'Greeting Pines' on the southwestern cliff are two attractive resorts. Mt. 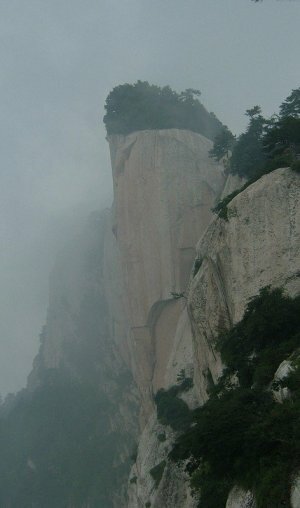 Huashan is famous for its magnificent cliffs. Nowhere are the cliffs more difficult to climb than the South Peak. There are rugged cliffs on all four sides of South Peak. 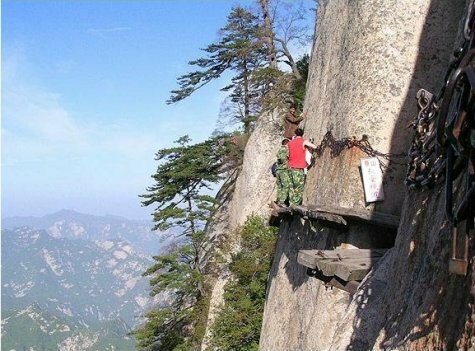 The most dangerous place is called 'Changkong Zhandao' (a wooden plank path built along the surface of a vertical cliff) which is about 4 meters (about 13 feet) long and about 0.33 meters (about 1.1 feet) wide. In order to reach certain temples and the caves of the sages great courage is needed. The climb to the top is a very challenging hike that includes sheer cliffs and substantial elevation gain (more than 5,000 feet, much of it on stone steps). The climbers must scale several steep cliffs with only a linked chain for support. However the rewards are spectacular�the dramatic scenery is just as impressive today as it must have been a thousand years ago. From the top, the Yellow River can be seen winding its way through the valley below about 15 miles to the northeast. Below is the bottomless gulf which makes tourists shake with fear. To fall is certain death. 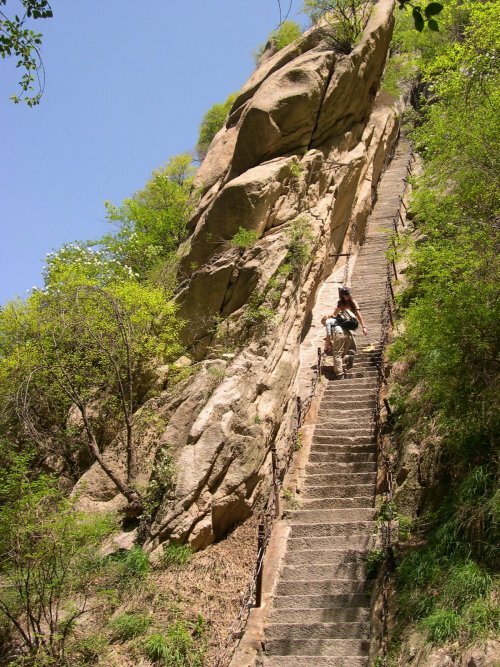 These steps are the Starting Point for the hiking trip up the West Peak mountain. As you can gather, the initial part of the climb seems steep, but safe. In addition, the view is awe-inspiring. Who wouldn't be tempted to look for the incredible beauty said to greet each traveler at the end of the climb? More pictures of the Heavenly Stairs. Black Dragon Ridge), is Part Two of the climb. Now the grade becomes even steeper than the Heavenly Stairs. You may be incredulous to discover people make this climb in the winter snow! After Canglong Ridge, you reach Jinsud Pass. Jinsud Pass is Part Three of the journey. Judging from the pictures, this area seems narrow. Looks must be deceiving. Although the ridge seems barely wide enough to allow people to walk on it, there is obviously enough room to support several structures. At the end of Jinsud Pass, there is a choice: West Peak or South Peak. Many people continue to the West Peak for a good reason: The West Peak route is quite safe. Plus Zhenyue Palace is up ahead. The perilous climb is located at the South Peak. 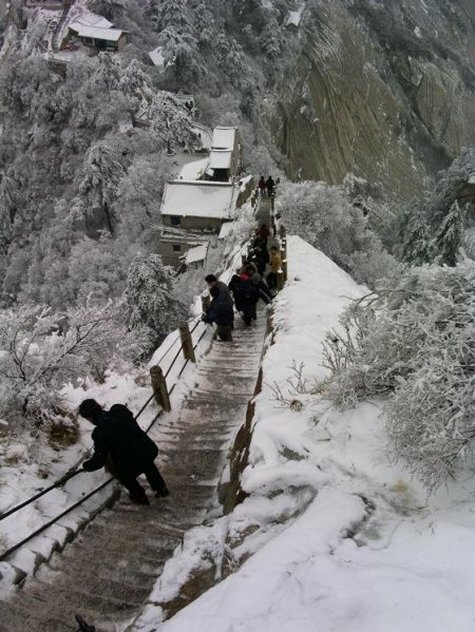 Apparently thousands tourists visit Huashan year-round regardless of the conditions on the mountain. As stated earlier, Mt. Huashan has five peaks. The West Peak seen in the pictures above is said to be the most graceful peak. On the other hand, judging from the picture below, even the West Peak Temple doesn't look that easy to reach. That said, the view atop the West Peak Summit is breathtaking! Now you see why people make the climb. Here is a look at the East Peak. This temple is known as the Playing Chess Pavilion. Who can concentrate on chess with a view like that? Although every peak has its challenges, the most aggressive climbers usually migrate over to the trail that leads to the forbidding South Peak, the highest of the 5 mountains. They are in for one of the most dangerous adventures of their entire life. To say the South Peak climb is 'formidable' would be an understatement. 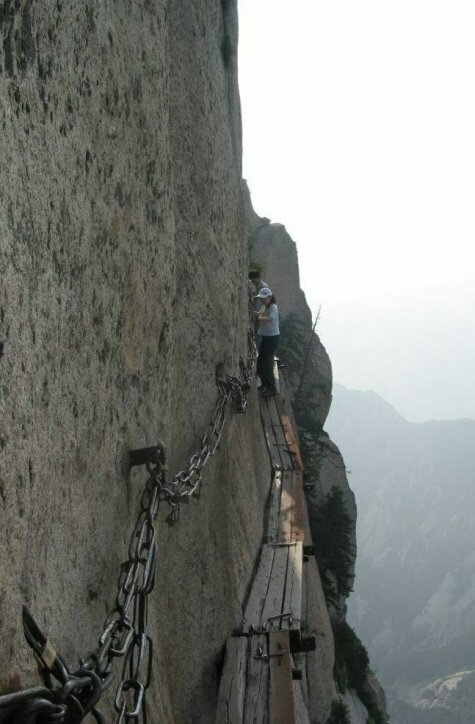 Along the cliff of South Peak is a planked path equipped with iron chains. These devices help, of course, but there are few safety features. One mistake and the climber meets eternity. Further up it gets even more difficult. Here there are chains and rock footholds which allow the adventurers to continue on the frightful path past precipitous rock faces and yawning chasms. Always far below, the valley beckons. Only the foolish dare to look down. Furthermore, no one dares to think of the trip back. In some ways, that's even tougher because you are so tired. 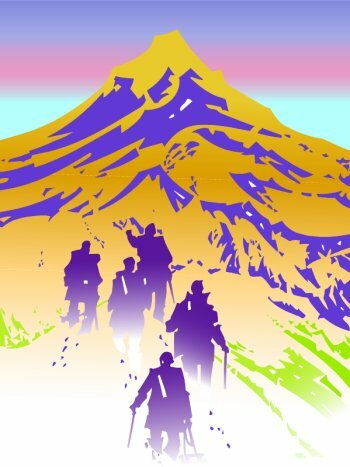 Interestingly, many people consider the huge throng of climbers to be the trail's greatest threat. The trails are very narrow. Don't forget the people coming down have to get around the people coming up. People are always scared to death the people passing them are going to do something stupid and take them down with them. Another fear is that the climber in front could slip and knock a nearby climber off the mountain as well. As vast as the mountain is, the trail just doesn't feel wide enough to accommodate all these people. Please keep in mind these climbers are not professionals! Most of them are Chinese college kids here on vacation. They are not equipped with any sort of modern climbing equipment or even the proper shoes. Nor do they have climbing experience. All they have going for them are their hands, their feet, and their courage. But always there is the temptation of the magnificent beauty. The scenery changes at every step along this path. The Beauty of the Mountain seems to cast a magic spell over all who pass. Rick Archer's Note: I did not write the following story. In fact, I have never even visited China although I certainly hope to someday. I live in Houston, Texas, USA. This story was written by an American who scaled the South Peak with his wife in the winter of 2003. His story is quite compelling. The pictures you will see were taken by many different people. I visited about 100 Internet sites in my attempt to compile a photographic tribute to this rigorous hike along the perilous South Peak. After reading this story, I think you will agree that a hike this difficult would never be permitted here in America. Obviously the Chinese see things differently. Our gondola ride up from the base of the mountain was a good idea. Not only was the ride a lot of fun, we saved a great deal of time and energy. But after the gondola ride, my wife Laura and I soon found ourselves climbing hundreds of icy, steep steps using the flimsiest of guardrails. Despite the fact that we had both slipped a couple times, we stubbornly continued. Now our walk had brought us to this spot. As I stared up at the near-vertical staircase before us, I wondered how on earth did I ever get in this mess. Not only did I feel in danger, I felt responsible for my wife as well. 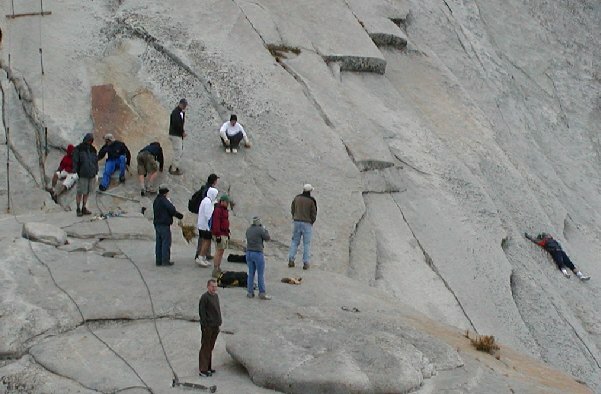 Steep steps were carved into the rock with chains for support. Cleverly, there were two ladders - one for �up� and one for �down� (see picture at left). Despite this, our hearts were racing as we saw where the ladder�s steps went vertical at the top of a 20 meter climb. The stairs were so imposing we had little choice but to stop and think about it. We could see the climb ahead was the steepest, least-protected section yet. Making things worse, I thought I could see ice on the steps. This wasn't going to be easy. I was losing my patience. "This is ridiculous! I can't believe they expect people to climb this thing! We should have stopped a long time ago!" Laura stared at me with an odd look. I couldn't figure out if she agreed with me or not. We almost had quit once before. I don't know why we didn't. Actually, I know exactly why we hadn't quit. We had spent days fighting language barriers and a transportation system that was not designed to be foreigner-friendly. I can't begin to count how many people we had to stop just to find one person to explain in English how to find this obscure place. Now that we were finally here, we weren't going to get another shot at this climb. Our plane tickets dictated we leave the day after tomorrow. It was today or never at all. I suppose another thing that kept us going was the noisy throng of people who passed us while making their descent. This indicated to me that the peak must be close by. If all these Chinese people made it, I figured so should we. I had a war going on inside my brain. It was driving me crazy. The "Courage" side of my brain was engaged in a knockout fight with my "Reason". So far Courage had the upper hand, but Reason aided by Fear was making a move. Meanwhile my pessimism had rubbed off on my wife. Laura was having second thoughts. As we stared up at the vertical staircase, Laura's quizzical look had changed to a frown. "I don't know if this is such a good idea, Frank. Maybe we should throw in the towel. Do you want to stop?" I stared at her quietly. Laura was right. Maybe this wasn't such a good idea, especially not with these winter conditions. The spot where we stood was actually quite beautiful. We could see the vast wilderness of the valley below and three of the other four peaks of Mt Huashan. I was overwhelmed by the splendor. No wonder this place was revered as a religious area. Unfortunately this snow-covered paradise was dangerous in the same way a beautiful woman is dangerous - too risky, but too beautiful to resist! My inner conflict continued. Part of me could not bear to give up this adventure of a lifetime. The splendor of this mountain was overwhelming. On the other hand, I wished we had stopped a long time ago. The Staircase we had just completed had been no picnic. For the entire climb the two of us had been clinging to the railing for dear life! However, despite the freezing cold, the blustery wind, and steps that were iced over, like fools we stubbornly kept walking. I admit it. This was mostly on me. I had not wanted to stop. We had not paid 300 yuan apiece ($80 total), spent 3 hours on a minibus, sat through a half-hour lecture about the mountain, taken a 20-minute cable car ride, and climbed snowy, icy steps for 45 minutes just to get so close to the top! The chances we would ever return to this place were slim to none. This was my chance. It was impossible to quit now that the top was in sight. Yes, it was cold, icy, and threatening to snow, but this would probably be the only chance we would ever have to climb to the summit of Huashan. This was one of the most famous mountains in China! I uttered a lukewarm response to Laura's idea of quitting. We talked a little more, but soon the subject was dropped. Laura said she had not really wanted to give up either. 'Yeah, sure,' I thought to myself. I was very worried I had made the wrong choice here, especially since I had no idea what was up ahead. We continued to inch our way up the steps until they suddenly became steeper still, and even closer to the 400-foot drop on either edge. I forced myself not to look down. Finally we made it. Now we could see what was up next. Instantly we both stopped breathing. We stared up at a steep vertical cliff. It was the final major obstacle before a hike to the temple. Fear gripped me as never before. The cliff ahead frightened me out of my wits. At this point, my fear escalated to a level I had never previously felt before. My inner debate raged on. This was the third time "Courage" was in great danger of losing. I was the cat who had climbed the tree and could not get down, only here nobody would or could come to my rescue. It felt like a bad dream; I wished I could just escape, and wake up in my warm bed, but there were no warm beds here, only biting cold winds, ever-accumulating snow, and icy steps. I knew we would have to get out of this on our own. I was overwhelmed by fear-induced nausea. I don't have a head for heights. I felt rather sick looking at the rickety wooden walkways and the rusty chains hanging over the precipitous drops ahead of us. I continued to gaze up at the cliff above. I was astonished to see an absurd number of giddy Chinese scaling the treacherous steps with almost reckless abandon, some wearing what can only be described in English as "dress shoes," specifically the kind with smooth outer soles. "What is wrong with these people?!" I thought. "Are they insane?! Stupid?! Both?! Why aren't they afraid?!" Why indeed did the Chinese people seem so unfazed by this treacherous path? My mind drifted back to rumors that people regularly fell to their death attempting to climb the mountain. After what I have seen so far today, I had no doubt these legends are correct. And I had a sixth sense that told me the worst was yet to come! Why on earth would I try? Picking your way along a sheer cliff surely isn't an enjoyable way to spend a holiday, no matter how good the views are at the end. Had I discovered a previously undetected 'Death Wish'? There is, off course, a certain type of traveler who enjoys the bravado and back-slapping of dangerous travel. I'm certainly not one of them, although I suppose I am more adventurous than most. But today, I was not here out of bravado. I was here because I really didn't know any better! I was the accidental mountain climber who got in way over his head. Danger is a hazy concept. For starters, we never know the exact probability of an unfortunate accident. Our minds try to estimate it based upon past experiences, hearsay, and whatever knowledge we have accumulated. Even once we think we know the chances of tragedy in a certain situation, there is still the question of whether or not to be afraid. I wished I had a feeling for the frequency of accidents at this part of the climb. But no one around us spoke a word of English. What was the probability of an unfortunate accident? Right now I was more scared than at any other time in my adult life. How much risk is too much? Was I supposed to be afraid of this? Maybe it isn't as difficult as it looks. Everyone else I can see is motoring up the cliff. It can be quite difficult to know when to say "no". Laura and I talked some more. As we talked, one Chinese person after another walked past us and started to climb the ladder without even a moment's hesitation. That's when I decided to continue. I wish I hadn't. As long as I live, I will never forget the next part of our climb. I asked Laura if she wanted to go first or have me go first. Laura nodded for me to lead. The first thing we did was climb a metal ladder that had been bolted into a natural chute (see picture at right). In other words, there was a chimney-like crevice in the side of the cliff. The consequence of a mistake was certain death. On the other hand, how often do you fall off a ladder when you are paying attention? Just make sure the grips are secure and you have a firm footing before taking each new step. This climb was scary, but we made it. The next part was actually pretty cool. At the top of the chimney , a skimpy trail had been carved into the side of the mountain. This trail wound through improbable niches in the rock face. Laura and I moved sideways across the face of the cliff. Things got much easier. We soon discovered there was a natural ledge that had been used to create a trail. Where the ledge was not sufficient, a man-made trail had been carved out of the rock. We were very relieved to discover there was also a metal fence to help as we crossed the cliff to the other side. The uphill climb in the chimney had been tough, but I started to relax when I found how easy it was to walk on this path. The chain fence added much-appreciated security. Yes, it was still possible to slip, but if you held onto the chain, it was unlikely you would plunge over the edge. Believe me, I held on tight. In addition I dared not look down. My balance depended on my confidence. The more scared I got, the worse my balance became. I kept my eyes glued to the granite surface of my path. I missed the beauty of valley because I kept my blinders on. Stupid me, I made a mistake - I looked ahead. That's when I discovered my safe rock trail was about to end only to be replaced by an absurd wood ramp of some sort. I panicked and stopped in my tracks. Seeing this ramp coming up, for the fourth time that day I had myself convinced to go back down when out of nowhere 6 Chinese college kids caught up to us. Although they were unfailingly polite, I could see they wanted Laura and I to get it going. Since this place was too narrow for them to pass us, we were holding up the line! Embarrassed, Laura and I started our slow trudge forward. As we neared the place where the trail changed from rock to wood ramp, I was grateful to find a small recess in the mountain. Laura and I stepped in to allow the Chinese students to pass us by. I could not help but notice their smiles and laughter. Their fearlessness had begun to aggravate me. Why weren't they afraid?! They were laughing and joking. No fear. Heck, I was glad to let them go by. Now we could move at our own pace. Yes, there were chains to hang onto, but there was ice and there was wind and the margin for error was very small. Those planks could not have been more than two feet wide. Exposed to the elements, I wondered just how safe they were. The only reason we continued was those crazy Chinese college kids. Laura and I watched them cross. It looked like they were dancing... step apart, step together, step apart, step together... they walked sideways across the cliff! And they were laughing! I swear to God if it wasn't for those kids, Laura and I would have turned around a long time ago. Left to ourselves, we would have given into our panic, but to see those crazy kids fearlessly move across the cliff made us think we could do it too. Laura and I gave each other the "what are we getting ourselves into this time?" look. Laura decided to simply watch, but I felt shamed into trying. I grabbed the chain, made sure not to look down, and did my step-together-step across the face of the rock. I kept telling myself if they can do it, I can do it. Nevertheless, I nearly slipped one time. Normally I never actually picked up my feet, but there were places where the new set of boards didn't match the set I was standing on. Since I didn't dare look, when I switched to a new board, each step was an adventure. As I took a step to the new board, my foot didn't hit the board right and my heel slipped on the edge of the board. I had only my left leg for support. I gripped tightly to the chain and regained my balance. Laura, bless her heart, didn't see it. Back at the starting point, she was looking off into the valley. Despite how careful I had been, I had still stumbled. A panic attack immediately kicked in. I could feel my knees shaking. I was scared to death to take another step. I just stood there and breathed a while. Laura asked me if I was okay. That broke the ice. I decided I hadn't come nearly as close to dying as I first thought. So I nodded I was OK and started moving again. Soon I actually managed a laugh of my own. I found a spot on the rock smeared with lipstick. I suppose one of the Chinese girls had pressed her face so close to the wall, she kissed the rock. It wasn't easy walking sideways on this vertical cliff. One mistake and I would fall straight to that valley about a mile below. If it was on flat ground, it wouldn't be that tough. But here the stakes were certain death. That knowledge affected my poise considerably. I thought about the Chinese kids some more. I wondered what would their parents would think if they knew one of those climbers was their kid? This climb had become incredibly dangerous. 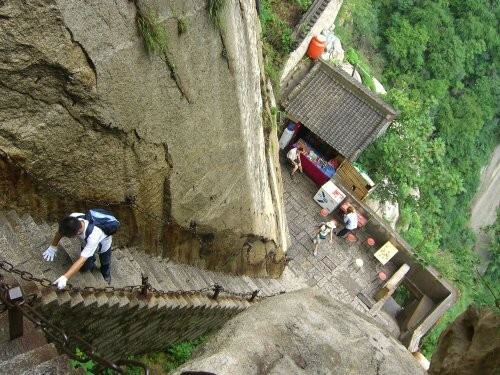 What was it about about the Chinese culture that permitted their citizens access to such a dangerous route? I honestly believed that some people died doing this! The only reason we were here was because we didn't know any better. I was incredulous that something this deadly was open to the public. Sure there were warning signs down below, but nothing had been said that could possibly let us know how much trouble we were getting into. I thought back to a presentation that had been given on the bus trip. An expert on this area had given a lengthy outline about Mt. Huashan in Chinese. Our bus guide whispered a shorter version in broken English to us. Our fate might have been different if we understood Chinese. It might have kept us from being here! My hands were starting to hurt from gripping this freezing cold chain. I wished I had the foresight to bring some bicycle gloves for protection. Moving at a snail's pace, I neared the end of the plank. It had taken me 10 minutes to move a couple hundred feet. It had been the longest ten minutes of my life. As I reached the end, it should have been a triumphant moment for me to make it this far, but I was too nervous to appreciate it. Now I slowly retraced my steps back to the trail. I was totally drained. Once I made it back to safety, I looked ahead to see our next challenge. There was more climbing ahead for us, but this time we would use footholds instead of ramps. There was an enormous round boulder. Someone had risked their lives to cut footholds into sheer rock. Nice feature, but this still wasn't going to be easy. Laura and I stopped to watch the Chinese kids. I gave a silent thanks that they had not gotten too far ahead of us. Now I could watch them to give me some more inspiration. I quickly realized how we had managed to catch them - two climbers were trying to descend. The college students had to wait till these people got down. The foothold path was definitely not a two-way street. One girl slipped coming down and screamed. I swear my heart almost stopped beating as I watched her struggle to regain control. But she recovered and eventually so did I. Now the kids who had passed us began their climb. There were six students in the group - four boys and two girls. As I watched them go up, I got a new sick feeling in my stomach when I realized how precarious this new section was. Those footholds made me wish for the wooden planks again. When they were done, we had to wait for yet another group to descend. In all, we spent nearly twenty minutes at this spot. The entire time my anxiety was ratcheted up. Like the wooden boards before, this particular section had no safety features at all. I shook my head in disgust. One mistake would kill you instantly. This area was so dangerous it required proper mountain gear: climbing boots, carabineers, belay devices, bolts, and ropes. But all we had was our bare hands. Now it was our turn. However, before we could start, a bitter wind picked up. I dropped to my knees for protection and Laura took my cue. For what seemed like several minutes we huddled there on the trail waiting for the wind to let up. Finally the wind abated, so we stood up. Time to go. I wasn't looking forward to seeing that wind hit us on the foothold path. Laura gave me a wan grin. "Boys first!" I smiled, but disagreed. I told Laura I would rather let her go first in case she slipped. This way I might be able to catch her if something bad happened. Laura nodded. Looking at it this way made sense. I watched as Laura grabbed the chain with both hands and stuck her right foot in one of the footholds. Putting one hand over the other, she slowly shifted her weight to her right foot. That's when she discovered the footholds were wide enough for both feet. Now it was time for her left foot to join her right foot in the first foothold. The next foothold was about six inches apart. Clinging to the chain with both hands, she fished around with her foot till she found each new foothold. Now it was my turn. The path was diagonal - part sideways, part upwards. I estimated the climb at about 20 feet. One mistake and I would die. I could feel the adrenaline surging through my body. I felt shaky and scared. But I wasn't going to stop now. That said, I found this 20 feet climb to be incredibly scary. What if I slipped? The fear alone made my hands and legs tremble. Every motion I took was careful and deliberate. I didn't trust myself to make even the slightest aggressive move. My caution paid off. Amazingly we both made it to the top without problem. Now it was time for one last obstacle. We needed to climb across a sheer rock face to reach the temple above. The end was in sight. All we had to conquer now was the Staircase at the top of the world. I called it "Stairway to Heaven". Led Zep would have surely agreed. I noticed the Temple at the top and idly began to wonder how the people who worked there got up and down the mountain. Was there a secret elevator? I was immediately suspicious there might be an easier route, but if there was, I never found it. The excitement of almost being at the end made us both take the steps too fast. We forgot how exposed we were out there on the ledge. Almost immediately we were hit by a gust of wind that knocked us both off balance. Both of us grabbed the chain for dear life. Any stronger and we could have easily been swept away! The one thing that I can say but probably never adequately explain is the vastness of the world below. As we crossed this barren rock, I could see forever. The commanding view from this spot was truly something to behold. How stupid of me to relax to take in take in the scenery. The moment I let down my guard, we both had to drop to our knees for safety as another gust took us off guard. Just when we thought we were in the clear! Slowly we got to our feet and started climbing again, albeit more slowly this time. My heart was thumping at the near call. This climb was definitely not for the faint of heart. I clung to the rope for dear life. Whatever scenery I was missing would have to wait for my confidence to return. From that point on, we were completely exposed to a strong wind that never let up. However, the goal was in sight so we kept going. Wind or no wind, we were determined to finish. Unfortunately, despite our good winter coats, Laura and I were both shivering. It had to be close to freezing this high up. No wonder they call it "wind chill". One step at a time we climbed the stairs. Gosh, my legs ached! Teeth chattering, legs throbbing, we made steady progress. Soon enough we were finally safe inside a beautiful Tao temple atop the summit. Finally. As I stared out the windows safe from the wind and the cold, I don't think I have ever felt happier in my life. I was so relieved to be here. I could not believe what Laura and I had overcome to make it this far. I made a quiet prayer of thanks for our safety to the Almighty. There was an observation post at the very top that allowed us a 360 degree look at the world around us. Everywhere we looked, huge mountains and deep valleys greeted our eyes. The beauty of the view really escapes description. I could have stayed there all day just to watch. But our reverie was shattered when a Chinese park ranger came up and warned us that it had begun to snow further down. For our own safety, maybe we should go now. Judging from his concerned expression, that seemed to mean 'right now'. Laura's face turned white with fear. Me too. Sorry to say, any courage I had in reserve left me immediately. All that work to get here and all that risk for a lousy ten minutes on the top of the mountain. But we didn't have any choice. It was time to go. Laura and I gathered the courage to descend South Peak. I was astonished to realize I had not given a second thought to getting back down. I was sick in my stomach again. Knowing what we had to go through to get back down with snow and ice making things worse had me worried. Sure enough, the winds were even tougher as we climbed down the treacherous Staircase. But at least we enjoyed having gravity on our side for a change. Snow mixed with ice fell on us. The snow had just been flurries as we climbed down the steep staircase. Now as we reached Foothold Lane (known as Somersault Cliff to the locals) the snow began to fall in earnest. As a result, we found the steps were filled with slush. That didn't help a bit. Moving at about the speed of molasses, we took it one step at a time. I was so glad there weren't any chirpy college kids around expecting us to move faster. I had two thoughts. I smiled as I realized the experience of going up did make getting down a lot easier. But I frowned at the unbelievable amount of concentration I was forced to use to ensure my safety. The pressure was enormous. Next we climbed across the path carved out of the cliff. This part wasn't so bad because there was actually a chain fence for safety. The path took us back to the Chimney. Heck, the Chimney was just a ladder. At this point, I was starting to feel about as confident as I had all day. After Foothold Lane and Boardwalk, the rest was just a hike. Nothing too scary. Laura seemed to relax as well. Holding on tightly, we made it down in good time. As far as we were concerned, the worst was over. Let it snow. We were now on the original Staircase of Suicide. The cable car station was just a couple hundred yards away. The end was in sight. Suddenly something happened that I will never forget for the rest of my life. About fifteen yards in front of me, a Chinese man was walking carelessly along a relatively flat portion of the walkway. I had noticed he wasn't even holding the metal chain. Without any warning, he suddenly lost his footing, slipped and fell. With only a few thin pine trees on the snowy slope separating him from a 600-foot drop off the edge of a sheer cliff, the man reached back with one had to grab onto the safety chain just as his feet slid under it. If he had missed the chain or his grip broke, the pine trees would be his last chance. But he held tight and broke his momentum. Slowly he pulled himself back to his feet. Laura and I were too stunned to even move. Only a lucky last second grab of the chain had saved him. This guy had missed death by a hair. Before I could even muster a breath, he turned straight around and looked at me. In perfect English, he calmly said to me, "It's very dangerous here. You should be careful." I just about fell off the mountain myself from shock. An instant before, only a rusty, icy chain had come between this man and almost certain death. But the man's first thought after almost dying was to warn ME to be careful! What an amazing man. Fear of heights must not be part of the Chinese ethos. Not me. This guy's brush with Death had me spooked. Now I kept BOTH HANDS on the safety chain. I had not taken a single carefree step in over an hour, but now I concentrated even harder. Not two minutes later, Laura screamed in terror as she slipped on the ice just like the Chinese man had. Even though she was on guard, her feet still went right out from under her. Fortunately she had a firm grip. She saved herself from careening down the slope by bear-hugging the safety chain just as the Chinese man had. I was there in seconds, almost slipping myself as I hit an ice patch. These icy steps were deadly! As I helped her up, I did not feel as much shocked, scared, or relieved as I just felt angry at myself for allowing us to be in this spot. From the very start, my better judgment had been put aside by a combination of wanting to get "my money's worth" and from observing all the Chinese people giggling up and down the mountain without regard for consequences. Always way too competitive for my own good, I had allowed my judgment to be clouded by my need to think I was just as brave and athletic as these kids. As a result, we had spent nearly two and a half hours on this icy, treacherous mountain path with scant guardrails and few safety features. Deadly drop-offs were just one mistake, one slip away the entire time. Now as exhaustion set in, Laura had made a near-fatal mistake. I was beside myself with anger at my stupidity for putting us in this spot to begin with. If she had gotten hurt (or worse), I would have never been able to forgive myself. I was furious with myself for my ignorance. I had no idea how easy it was to slip going down the steps. But mostly I was angry for trying to compete with the Chinese. I had gotten so used to thinking the Chinese knew what they were doing that I did not realize until the man slipped in front of me that my judgment had been right all along - this mountain path was a death trap. Someone could have a heart attack from exertion and fall to their death. Someone could faint for even a moment and lose their footing. Or a trembling foot could miss a foothold and make a fatal slip that would cost them their life. Even a simple mistake like Laura's could end it. Laura had been concentrating as hard as she could and still slipped. We were lucky to be alive. Ironically, two days later, we stopped at a temple in nearby Xian. Laura picked up a pamphlet and started to browse. I heard her giggle. Curious, I asked her what was so funny. Rick Archer: Many people assume I wrote this story. Please be assured that I did not. 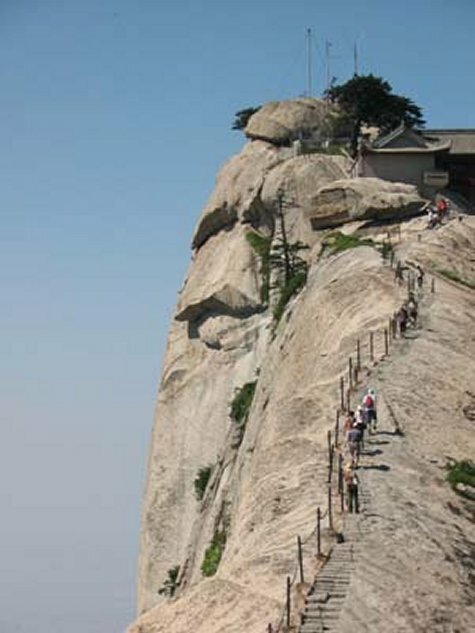 I have never been to Mount Hua nor China. I received Frank and Laura's story in an email that had been passed along so many times that I had no way to retrace the origin of the story. Over the years, I have been asked questions about discrepancies in this story. All I can do is shrug my shoulders. I did not write the story nor do I know the person who did. However, there is a misunderstanding that I can clear up based on letters that have been sent to me since. One thing that Frank's story did not make clear was that the insane wooden plank walk known as the Floating-in-Air Road is optional. The plank is a dead end. It takes you out to a vantage point that gives you a spectacular look at the valley below. You take your pictures, then you slowly walk back to the main trail. No one has to take this plank walk unless they choose to. Furthermore, recent safety upgrades have added harnesses to the walk. Even if you slip, you will be safe. However, at the time this story was written, yes, the plank walk was just as terrifying as the story makes it seem, especially given the winter conditions. It is quite likely that Frank and Laura had to edge along this narrow plank while it was covered in ice. No wonder they were scared!! In November 2006, I received an email containing a dozen sensational South Peak pictures such as this "Plank" picture on the left. There was no credit listed for the pictures. Curious to know the story behind the pictures, I used Google to poke around the Internet. Tracking down a link suggested by Google, I ran across a site that led me to believe these pictures were taken by taken by a man named Senteur de Boue, aka "vebiltdervan". This "vebiltdervan" gentleman appears to have some sort of connection to the name 'Vanderbilt'. If you ever read the man's profile, you will understand why I am so unsure about his real identity. Then I ran across another site that cast doubt on my conclusion that 'vebiltdervan' was the source. Now he seemed to be re-posting these pictures. This means I have no idea about the identity of the person who first posted the pictures or who took the pictures either. Whoever took the pictures, I think we can all agree that they are wonderful. Changing the subject a bit, when I first researched the Internet for "Huashan pictures" on Google in early 2007, I could only find one other picture of the Floating-in-Air Road. I went from one site to another looking for additional Huashan pictures, but all I could find were the same dozen pictures I had received in my email. When I did my 2008 update, suddenly there were all sorts of new Huashan pictures posted on the Internet. Now the Internet was flooded with Huashan pictures. The difference was so amazing that for a while I wondered if it had something to do with the Chinese allowing or not allowing cameras. Then another thought occurred to me. 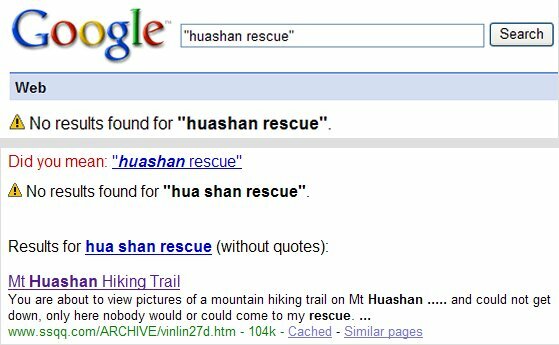 Once my January 2007 story went viral thanks to Google, many English-speaking people heard about Huashan first time. At that point, perhaps many Westerners decided to add Huashan to their itinerary on their trips to China. Later they posted their pictures. This is just a theory, but it seems plausible. As of 2010, I am now the retired owner of a well-known dance studio in Houston, Texas, named 'SSQQ' (slow slow quick quick). I ran my dance studio for 32 years. SSQQ Dance Studio was a major part of the Houston dance scene throughout the Eighties and Nineties, but a curious development known as "The Internet" was responsible for the studio's rise to become probably the busiest dance studio in Houston. At its peak the studio was visited by 1,400 dance students per month, double the pre-Internet average. The SSQQ Web Site came online in late 1998. Right from the start I realized the power of my web site to help grow my own business. The more I could interest my dance students to visit the SSQQ web site, the more they would stay interested in my dance studio. So I began to write a monthly Newsletter to my dance students and send it out by email. The initial results were okay, but no big deal. I asked someone for an opinion. Their answer? 'Boring'. Ouch. Chastened, I realized that dance newsletters were tough to make fascinating because dancers don't exactly cause much trouble. So how to make these Newsletters interesting? In addition to dance stories, I began to include anything and everything that crossed my path. Pretty soon jokes, unusual stories, haikus, limericks, logic puzzles, and strange pictures began to appear in each issue. This worked like a charm. The results were phenomenal. As one person said, my Newsletter was better reading than most magazines! My work on the Newsletter and the SSQQ website led to a curious development - people appreciated my Newsletter so much that they began to help me write it. As a sort of reward for doing a good job, my dance students began to forward me all sorts of interesting stories and pictures whenever they ran across something. Soon I had an entire network of friends sending me all sorts of good stuff. This pipeline stuffed my In-Box with all kinds of fascinating emails. In 2002 I began to receive email contributions from people I never even heard of. It took me a while to figure it out, but the source was this new thing called Google. People outside of Houston were finding my stories thanks to Google. Now people from other parts of the USA and even the world began to send me stuff because they appreciated the SSQQ web site. So now you have a hint how this Huashan story started. In November 2006, one of my dance students - Milt Oglesby - forwarded me the original dozen pictures of Huashan. I was so amazed by the pictures that over Christmas Break I decided to do a story on Huashan as well as the infamous Road of Death in Bolivia. As they say, one thing leads to another. 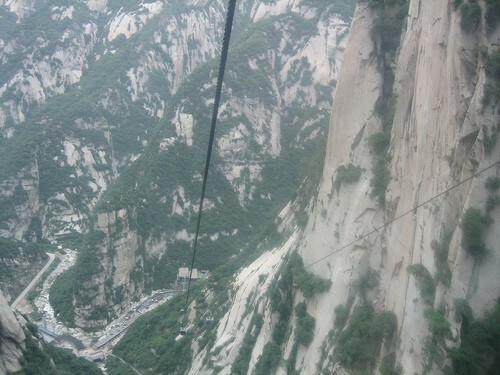 For a while there, I lived on the Internet looking for details of Huashan. My Internet Research paid off. 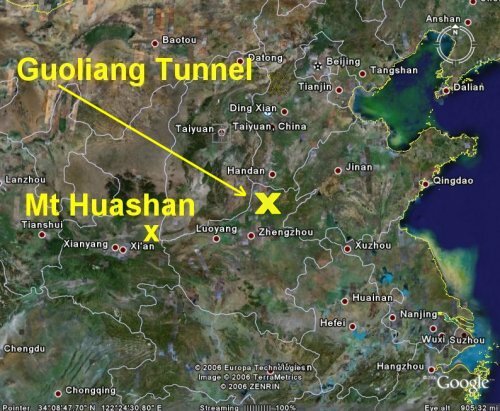 I uncovered the story of China's Guoliang Tunnel as well as the Russian Highway of Mud. Later on I was alerted to Spain's El Camino del rey as well. It all started with one email containing some great pictures and now I had five awesome stories! And that's how it happened. Now you know how a man who lives in Texas was able to write stories about exciting locations thousands of miles away without actually visiting any of them. To me, the Internet is something out of science fiction come true. The Internet is amazing. The email from Patsy is an example of the letters I get from total strangers who wish to comment on the Huashan story. So how do people from East Texas, San Francisco, and all over the world end up on a dance studio website looking at pictures from China? The answer, of course, is Google. You already knew the answer because the Google Search Engine is probably what brought you here too (or perhaps a link from a friend). When I first started publishing stories in 1998, my Newsletter was directed at my dance students here in Houston. Google changed all that. Starting in 2002, Google began to bring visitors to my website from all over the world. But why me? After all, I have never even been to Huashan! I wondered why my story had become so popular. Anyone who has ever played chess or studied military history knows that getting to a spot first makes a big difference. I currently have about five different stories that are listed on Google's first page simply because I wrote a story before anyone else bothered to do the same. Thanks and many happy trails from a 75 yr old granny in East Texas. P.S. and Thank you, William, way out west in San Francisco, for sending the link to this adventure on to me! This Huashan article is the perfect example. When I first researched the story, there were places that posted the same pictures, but had no story. Then I found places that had travel-style information about Huashan, but no real pictures. My webpage was the first to combine both a background story as well as the pictures. Together they were dynamite! The next boost came from my dance students. My email Newsletter featured my articles complete with a link. Their interest was the spark that initially pushed each new story towards the front of the Google Listings. In other words, by accident, I was the first person to do more than simply post Huashan pictures. 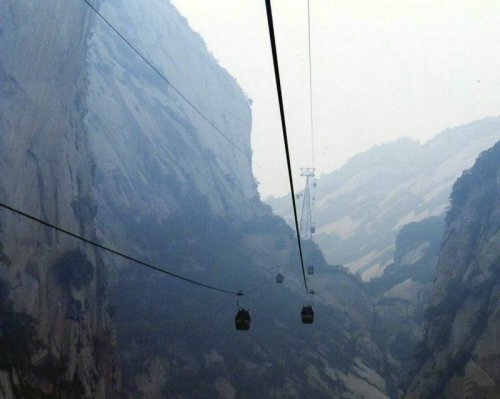 By adding an actual STORY to those mysterious pictures, people became fascinated with Huashan. Google noticed all the hits on my story and promoted my web page to the top. I am amateur writer. I just write this stuff for the fun of it. In fact, my friends tease me about it. Let me give example. This email below is from Gareld McEathron, a dance student and friend. Gareld has been a big part of my studio since the Nineties. In fact, Gareld met his wife Virginia here at my dance studio back in 1996. Over the years, Gareld has sent me many stories. In May 2008, Gareld sent me the same "Huashan email" that Milt Oglesby had sent back in November 2007. Gareld had no idea that I had posted my Huashan story on the Internet a year earlier. Boy, was Gareld surprised when I sent him a link to my Huashan story! He was so tickled that he immediately began to send my story to his friends... which of course helped my article maintain its status as the most widely-read story about Huashan. WOW!! Great story, Rick. I had not seen it before. Makes one wonder when you have time to teach dance. "Hi Kay, Knowing how much you like to travel to out of the way places, I thought you would find this story interesting. It was written by my friend, Rick Archer, who is a frustrated writer that is forced to make his living running a dance studio." So now you know why a guy in Texas who has never been near China in his life has the Page One Huashan article according to Google. Reason One: I got my article out first. Reason Two: My dance students gave an initial boost to each new article. By 'hitting' on my story, their interest attracted the attention of Google. Reason Three: Google listed my story towards the front because there was no competition. My story about Huashan was the first serious write-up. Reason Four: Once you are Famous, you stay Famous because you are famous. Over the years people continue to be directed to my site by Google. They in turn forward links to the page to their friends. All these hits from around the world guarantee the SSQQ Huashan story stays on top. My story is a perfect example of a story that stays famous because Google says to look here first. As I have written, in the years since this page was first posted in January 2007, my story about Huashan has been widely circulated around the world. Thanks to Google, it has become a favorite place to visit for anyone interested in a good adventure and travel story. During this period I have received a great deal of fascinating correspondence from the readers. Previously I posted these letters here on this "main page", but as the letters rolled in, my original Huashan webpage kept growing and growing. Finally the page grew too big, so in 2008, I decided to list the most interesting Huashan letters on a separate page instead. These letters are remarkable. As always, people continue to contribute so many wonderful pieces of information. For example, people have written to comment on locations such as America's Half Dome climb in Yosemite Park (California) and Angel's Landing in Zion Park (Utah). Thanks to these letters, I was alerted to El Camino del rey in Spain. You would be surprised at all the questions I receive about El Camino. 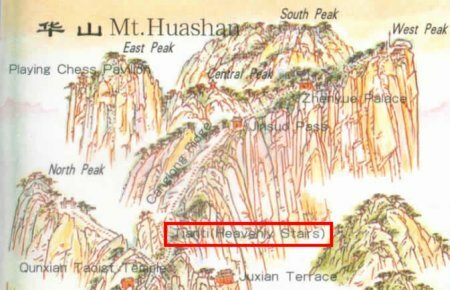 However, the greatest service these letters have provided is to offer detailed information about the status of the climb at Huashan. 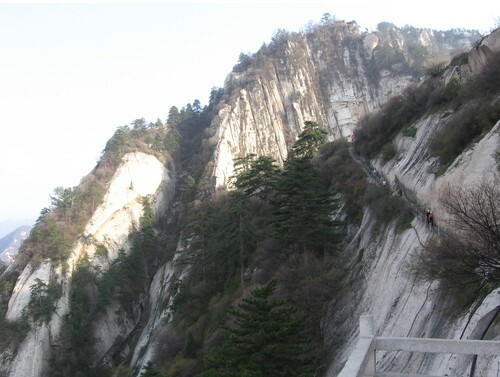 Many of the letters were contributed by people who have actually climbed Huashan. 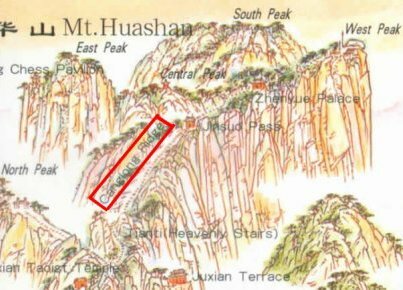 I think these posts give a more thorough idea about Huashan than my original article because many letters contain first-hand accounts of what Huashan is like today. I am a certain you will enjoy reading this section. 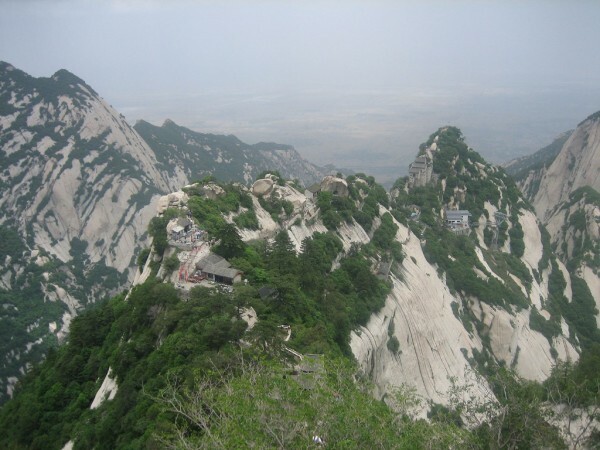 If you are interested in learning more about Mount Hua, the Huashan Letters are a 'must read'. 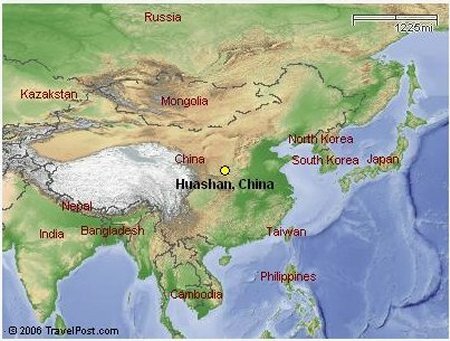 2011 Update: Is Huashan still as Dangerous as it Once was? Rick Archer Note: It is now July 2011. It has been four and a half years since I wrote my original article about Huashan. Thanks to all the wonderful letters I have received in this time, I think the time has come to make it clear that the climb at Huashan has become a lot safer since I first wrote my article. Back when I published my story in 2007, it was the first article written by a "Westerner" about Mt Huashan. Although I was unaware of this significance at the time, thanks to my story thousands of English-speaking people read about Huashan for the first time. So I will give myself a gentle pat on the shoulder for bringing welcome attention to this unique place in China. That said, throughout 2008, I received a tremendous amount of criticism that the article you have just read was misleading. I was baffled by the criticism and hurt too. So why all the criticism? People who had just finished climbing Huashan were outraged that I had the nerve to label the place "dangerous". In America, we have a saying that the left hand doesn't always know what the right hand is doing. Apparently my original story in January 2007 coincided with many safety improvements being made at Huashan. However I was completely in the dark as to these improvements. Living in Texas, I wasn't like I could look out the window and notice construction crews up on Huashan. Nor did the Chinese government bother to drop me an email. People who first read my story were surprised to find the climb was nowhere near as difficult as my story had suggested. Some of these people reacted very harshly, criticizing me for deliberately misleading the entire world as to the true level of difficulty. 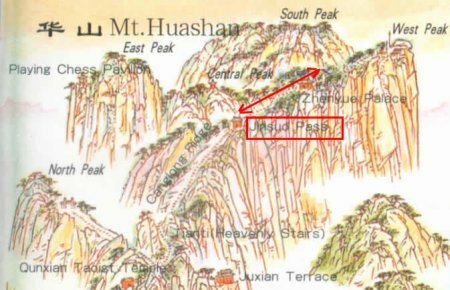 In fact, in 2008 a paragraph in a Wikipedia listing about Huashan openly suggested I had made false claims about Mt Huashan in a desperate attempt to achieve some sort of Internet glory. I have never felt so insulted in my life. No good deed goes unpunished, does it? But there wasn't much I could do about it. Back here in Texas, I had no idea what they were talking about. I was flying blind on this problem. In May 2009, I finally got my answer. That is when I received a remarkable letter from P. Allen, a man who had recently climbed Huashan with his children ages 8 and 11. 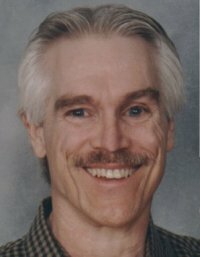 Mr. Allen is an American living in China. 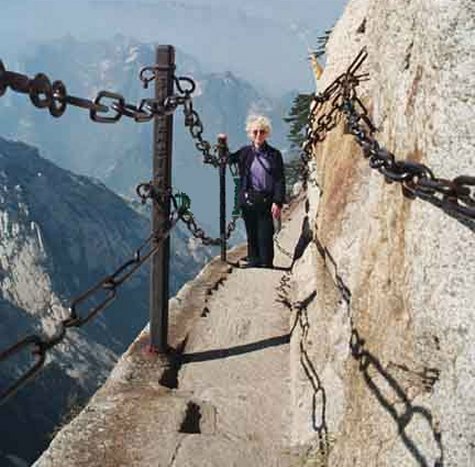 In addition, Mr. Allen's wife is not only Chinese, she had actually climbed Huashan back in the Eighties as a college student. 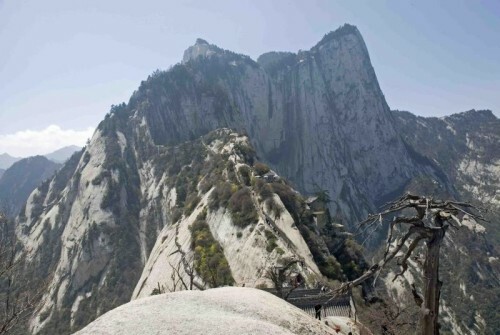 Now as the family climbed Huashan, Mr. Allen's wife was able to point out all the changes that had taken place at Huashan since her first visit twenty years earlier. After reading my article, Mr. Allen realized why the difficultly of the current Huashan climb didn't seem to fit my description. So he clued me in. The safety features had removed much of the danger. The reason behind all the improvements is tourism. In this past decade, China decided to open its doors to international visitors. While preparing to host the marvelous 2008 Summer Olympics in Beijing, China scouted the countryside for interesting places to send its tourists. Two places I have written about - the mountain tunnels of Guoliang as well as the beautiful mountain climb at Huashan - were selected as places of interest. With throngs of tourists soon to visit both locations, serious amounts of money were invested to make both places safer and easier to explore. Consequently today Huashan is no longer the monster it once was. I would like to give three gentlemen - P. Allen, Kwong and Karl - credit for writing the letters that prompted me to add this important update to my main story. Based on letters written to me over the past four years, I think the time has come to believe that the climb at Mt Huashan is no longer as difficult as it once was. That said, let it be clear that Huashan was at one time just as dangerous as this article has suggested. Just because the mountain has been declawed doesn't diminish its wild reputation of yesteryear. Rick, You might be tired of this by now, but I would like to add my comments. I started by googling "most dangerous hikes in Europe" and wound up with Mt. Huashan on a page that included Angels Landing, which I have had a number of adventures on, including a day after a major snow storm. Fun! This is an honest opinion and I hope you take it to heart. I am extremely adventurous, having climbed the cables of Half Dome nine times. I hope to do it a tenth time before I get too much older. 52 right now...booya! I feel it would be extremely misleading if the LEAD, NUMBER 1 article on the Internet about the Yosemite Half Dome here in America was PLASTERED with the headlines of DANGEROUS, DANGEROUS, DANGEROUS. Like Mt. Huashan, I have seen eight-year-olds on this climb. If those kids "let go" of the cables, yes, it's dangerous. If they hold on, it's safe. Amazing the human instinct for survival works quite well most of the time. Although I am mesmerized a bit by such adventures, as I read your story I concluded that Mt. 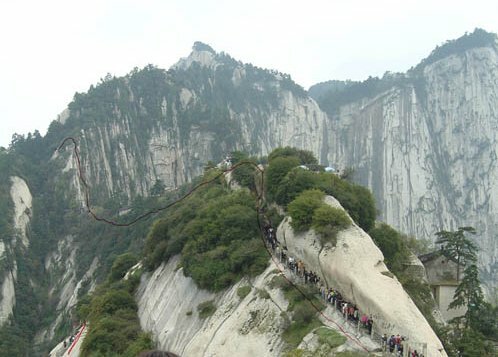 Huashan would be TOO DANGEROUS, TOO INSANE for me to participate in. This was my "impression" after reading your main Mt. Huashan page. Then I read your Huashan Letters. Now I received a totally different impression. Unfortunately, most people will not BOTHER to go and do the further research I did on your ""Letters" section. This "could" cause someone to decide not to participate in climbing this mountain. What a shame! My heart was totally palpitating reading about the 2002 climb. This was dangerous because it was pre-harness days AND it was snowing with icy steps. 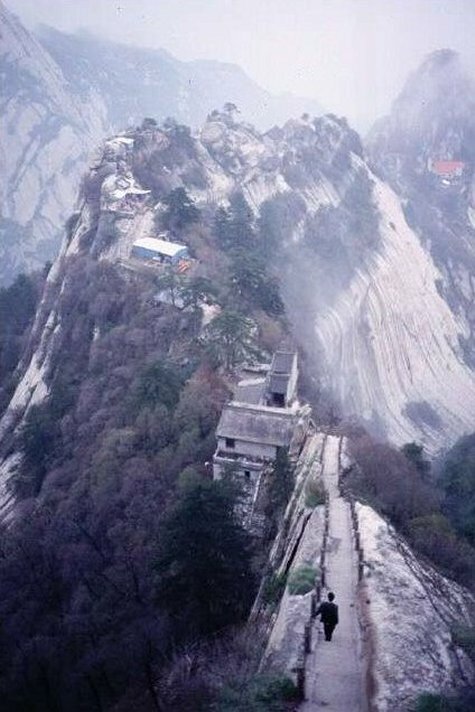 If one read nothing else about Huashan, the "impression" is: This is insane. Don't do it! However, after reading more on your Letters page (much more time than most people will spend) my conclusion was different: This climb would be awesome. Put Huashan on the bucket list. I feel it would be best to add a disclaimer on your lead page that safety precautions are now in place, instead of having to do so much research to get to the real danger involved on your other page. You must acknowledge the short attention span of most Americans. It would NOT take away from the fear and anxiety and the excitement of the story. After reading many of the letters on the letters section, I went back to re-evaluate whether a "false impression" was being left. I was shocked by all the DANGER, DANGER, DANGER emphasis, in all honesty, without a nice template explaining harnesses may/are now available for the dangerous sections being reasonably near the top of this article. After all this controversy, why do you keep the word "Dangerous" in the title of the article? How about "Exhilarating"? "Extraordinary"? "Mind-Blowing"?  "Life-Altering Adventure of Mt. Huashan"? You may be discouraging some people from participating in a great life experience. Rick Archer's Note: Karl's note was not only cordial, it was quite persuasive. So in 2011, I added several hints on this main page to suggest Huashan is no longer quite as terrifying as it once was. Just one piece of advice - if you climb Huashan, hang onto the ropes. For a great deal more information about Huashan, please visit the Huashan Letters page.